I'm going to peek in occasionally on a subgenre of Western films, called the Weird West, which combines westerns with supernatural elements. It's a surprisingly popular genre nowadays. If a western isn't a prestige piece featuring a big budget and serious actors acting serious, it's probably a Weird Western. Wikipedia has a small and not especially insightful entry on the Weird West, identifying it primarily as a mash-up genre. The entry quotes author G. W. Thomas, a contemporary pulp novelist who wrote an essay called "Crossing Horror: Using Horror in Other Genres," which is the source of Wikipedia's quote. "Unlike many other cross-genre tales, the weird Western uses both elements but with very little loss of distinction," Thomas wrote. "The Western setting is decidedly 'Western' and the horror elements are obviously 'horror.'" That's true of the movie I am about to write about today, and, to be fair to Thomas, is often true of Weird Western tales. But, as you'll see, it's not entirely true, and I'm not even certain it is mostly true. Because there is another tradition in the Weird West, and it's one that feels as though it rose indigenously with the story of the west. These are the frontier equivalents of Britain folk horror tradition: Tales that borrow from cowboy ghost stories, or Indian legends, or undiscovered monsters that might inhabit the vast, rugged land that stretched west of the Mississippi. We'll get to some of those films later. 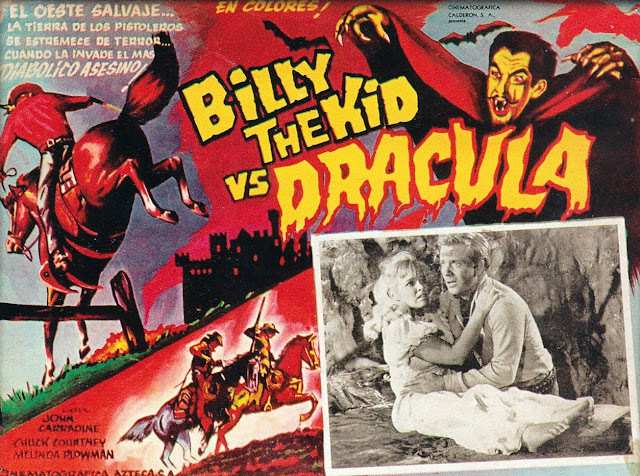 But our first film, "Billy the Kid vs. Dracula," is the sort of mash-up Thomas describes . Even though the film was lensed in 1966, it is untouched by the revisionist sensibilities that had started to dominate the American Western, and has more in common with the sorts of juvenile oaters produced by Poverty Row studios a decade or so earlier. There was no effort to recreate the historic west, nor to revisit it with fresh eyes. Instead, the story takes place in a nondescript Western town that was actually the Corriganville Movie Ranch, built in the 1940s as a movie set and looking like it. It featured stock characters, and it's first 10 minutes, featuring a drunk and a stranger on a "Stagecoach," seems an explicit nod to the great 1939 John Wayne western "Stagecoach," which also featured John Carradine. Carradine had been playing Dracula for a while, debuting in the role in "House of Frankenstein" all the way back in 1944, and his version of the vampire made terrific use of his Mephistophelean features, stagey mannerisms, and sonorous baritone. Carradine was often a very good actor, especially in westerns, as he was part of director John Ford's stock company. He is, it must be said, not especially good here. He may have disliked the role when he was doing it, and later regretted the film — here's the actual quote: "I only regret 'Billy the Kid Versus Dracula.' Otherwise, I regret nothing." Nothing really works in the movie. Billy the Kid is Billy the Kid in name only here — he's a reformed outlaw, and the filmmakers seem to have no actual historical understanding of the character, so he's presented as an amiable dreamboat, played by a young fellow named Chuck Courtney and looking like a Tiger Beat model. The actual Billy the Kid was jolly, loved to dance, was fluent in Spanish, and a recently discovered photo of him shows Billy in a striped sweater playing croquet. There's none of this here, and Courtney could be playing any retired gunslinger with a boyish face and indistinct but cheerful mannerisms. Likewise, the film doesn't seem to have a clear sense of what a vampire is. Carradine does sometimes turn into a bat — albeit one of the worst movie bats I have ever seen — and cannot be seen in a mirror, but the film has him allergic to wolfsbane rather than garlic (and the wolfsbane looks like red peppers), and he frequently seems to be out and about during the daytime, although this might be the fault of director William Beaudine, who did not seem to know how to lens a day-for-night shot. Knowing that it is not a very good film, however, does not preclude "Billy the Kid Versus Dracula" from being an enjoyable film. There is a tension created in the film, and it's fun to watch the film wrestler with it. In fact, there are two tensions, one in the text, and one on the subtext. Firstly, this film legitimately is a mash-up. The filmmakers took a bland cowboy movie and welded in a bland vampire movie, and every seam shows, to the extent that the cowboys are genuinely bewildered to find themselves in a vampire movie and the vampire seems to have no idea why he's in a cowboy movie. The only moment when Carradine seems remotely interested in the film is when he discovers there is a pretty young girl with a cave on her property, and the entire film consists of his plan to kidnap her and put her on a fairly nice antique bed in the cave, as though he can't wait to get out of the Corriganville Movie Ranch to someplace that felt more appropriate to the vampire. Billy the Kid is likewise a bit helpless. He is, after all, a gunslinger, but here's a guy who can't be harmed by bullets, and Billy the Kid doesn't have anything else he knows how to do. I am about to give away the film's climax, but, trust me, it won't ruin it for you when you see it: When Billy the Kid fails to kill the vampire by shooting him, he just tosses his gun at Dracula, the way frustrated villains used to do in the Superman television show. Unlike in Superman, however, this works: The gun knocks Dracula out, and Billy the Kid calmly stakes his unconscious body. In fairness, there is no vampire legend that says they can't be knocked out by hucking a gun at them, but it's still something of a surprise. 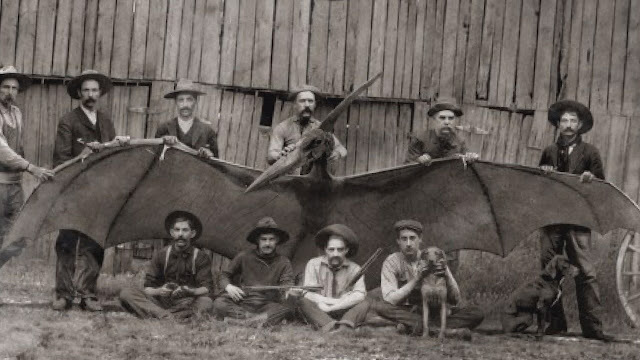 There's actually a cowboy in Bram Stoker's "Dracula" — the Texan Quincey Morris — who has a gun, and apparently the original vampire novel could have been much shorter if Quincy had just lobbed his sidearm. But, as I mentioned, there is also tension in the subtext, and it's a pity it goes unexplored. There is a moment when John Carradine gets angry at a vaguely European housekeeper who suspects him, shouting that the immigrant needs to be talked to. But Dracula was also an immigrant, and, a generation back, so was everybody except the Native population of this country. The story of the so-called taming of the West is actually one of an immigrant population seizing a land from the original inhabitants, and it is a mark of the film's lack of self-awareness that they didn't realize that Dracula is a perfect metaphor for that. After all, Stoker's "Dracula" is an invasion story, about a murderous immigrant coming to London to stalk and murder its population. It might have been fascinating to parallel the story of Dracula with the story of the West, and the film seems to nod at at, as the first person we see Dracula attack is a Native American, which then prompts a war party to kill everybody in the stagecoach that carried him. And why would the Indians distinguish between white men and vampires? Both were pestilent European invaders who murdered Indians to steal from them. In fact, the Lakota and Dakota Indians had two words for white men, one punning. The first, wasi'chu, which simply means "non-Indian." But the other word is wašin icu, and it means "taking the fat," and references white men who simply drained a place of its stolen resources, which seems appropriately vampiric. This sometimes makes me want to take issue with the idea that the Weird Western in a mash-up genre. The West itself was a mash-up, and Western stories are often about the conflicts between two different stories. For instance, the range war film is, essentially, a mash-up between a pioneer story and a cowboy story, with the two groups competing for the same resources. Believe it or not, it is entirely possible to tell a story about indigenous Americans in which no single white man appears, as they were here for thousands of years before Europeans made their way to these shores. This sort of film isn't made very often, but could be. It is likewise possible to tell pioneer stories where they never meet gunslingers, cowboy stories where they never meet Indians, and so on. But the Western has always enjoyed pressing these groups, and their competing stories, together and seeing what happened, especially since what happens is usually violent conflict, and violent conflict is one of the absolute staples of narrative storytelling. And so, yes, the Wild Western is often a mash-up film, but it's just mashing something new into a genre that already relied on mashing things up. It's no real invention to tell a story in which a monster moves west across America — that's always been the story of America. It's just that the monsters have changed.